The 6th World Modern Pentathlon Coaches Conference in Manchester (GBR) attracted a record attendance with 103 delegates from 18 nations taking part. The annual conference gives coaches from around the world a chance to share best practice and training methods and the 2018 edition included topics relating to pentathlon training in areas such as physiology, psychology and biomechanics. Coaches from Nepal and Bangladesh took part for the first time in the three-day gathering from November 16-18, 2018. 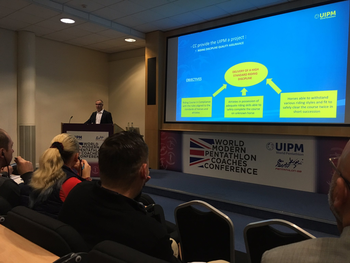 One of the highlights was a presentation about athlete safeguarding and harassment prevention, especially topical after the launch of the UIPM Athlete Safeguarding Policy earlier this year, and there were sessions about Para Pentathlon classification standards, coaching leadership and bone stress management. Christian Roudaut, Chair of the UIPM Coaches Committee, attended the conference along with fellow committee members Jan Bartu (GBR) and Istvan Gallai (HUN). Visit the UIPM educational platform to find a range of resources for coaches, athletes and judges.